“It would be an understatement to say that Ipsita earnestly strives each year to improve the academic environment fostering the success of under-represented minority students at the graduate, undergraduate and high school levels,” says McGowan Institute faculty member Steven Little, PhD, department chair of Chemical and Petroleum Engineering at the Swanson School. Service to the Swanson School in the recruitment and retention of underrepresented students through various internal and external programs. Beyond her work with organizations on campus, Dr. Banerjee devotes time and effort into programs like the Carnegie Science Center’s CanTEEN Career Exploration Program, sharing her experience with middle school girls and encouraging them to pursue an education in STEM. She has also been involved with the Women Student Networking conference, AlChE Women’s Initiatives Committee, and in panels for Women in Science and Medicine organized by UPMC. In addition to the award, Dr. Banerjee will receive a $2,000 grant and induction into the Office of Diversity’s Champions for Diversity Honor Roll. Dr. Banerjee’s mentees endorsed her nomination for this award because of her thoughtful support, encouragement and motivation. Her own professional success, they noted, makes her a valuable role model for other women and under-represented minorities in STEM. 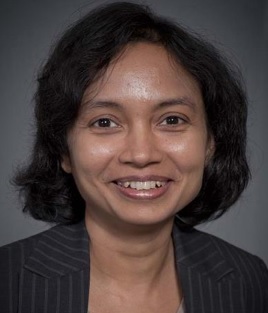 Not only did Dr. Banerjee’s mentorship inspire her students to conduct their own research and find their professional paths, but it also inspired them to be better mentors themselves. Brittany Givens Rassolkhani notes that now she is also a mentor and never forgot the lessons Dr. Banerjee taught. Illustration: University of Pittsburgh Department of Chemical and Petroleum Engineering.